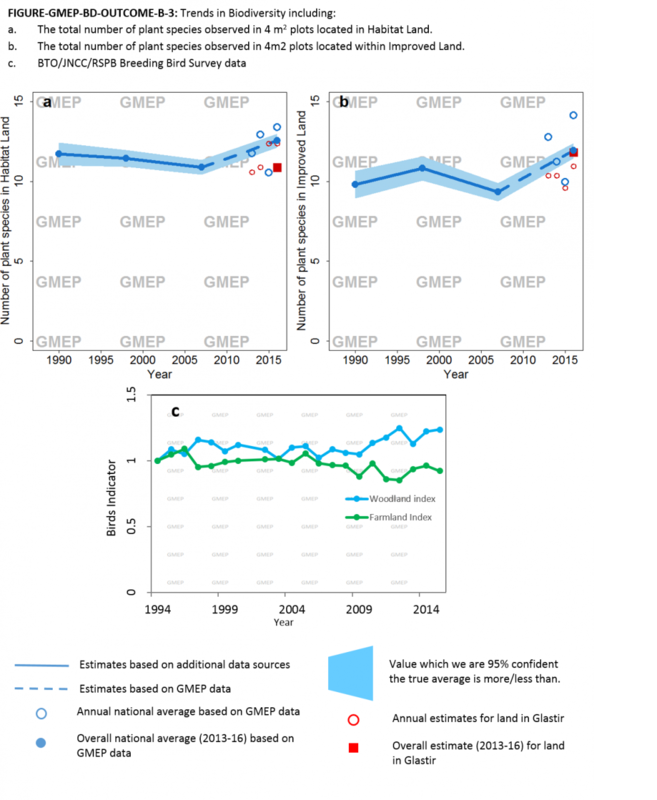 GMEP modelling results of the likely outcomes for biodiversity suggest that the direction of improvement in habitat condition for species studied is likely to be encouraged by the Glastir actions explored. 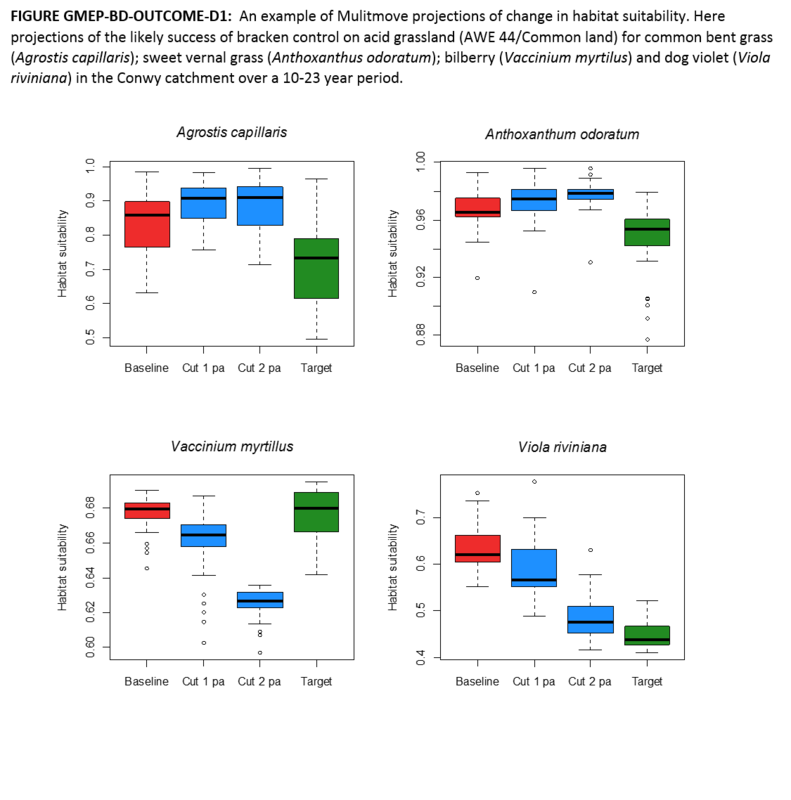 Modelling work using Multimove indicates a likely lag time of 10 to 23 years for soil and canopy height conditions to be suitable for a series of 21 common and some rare species associated with final target habitats for Glastir interventions. This emphasises the need for consistency and patience in maintaining interventions if the benefits are to be realised. 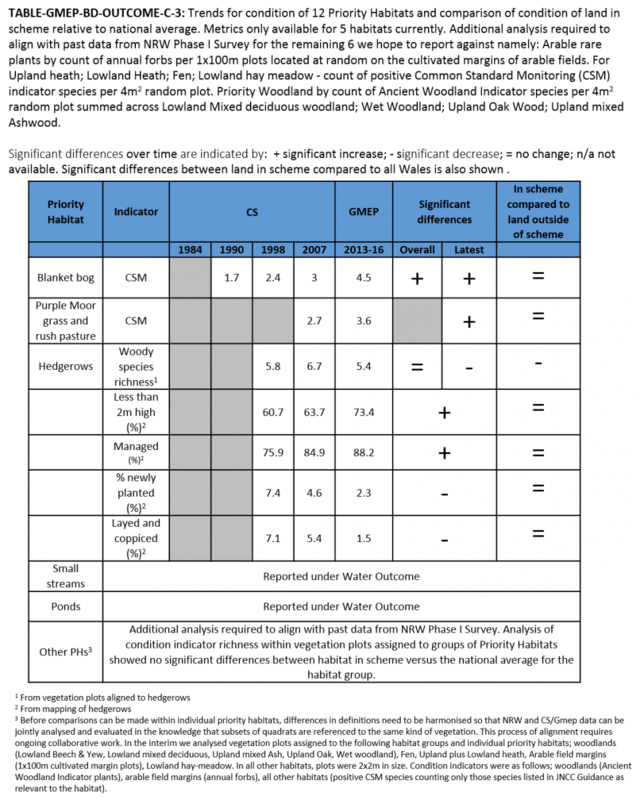 With respect to biodiversity, condition of land as indicated by plant indicators indicative of good condition is either stable or improving for arable, improved land, habitat land and broadleaved woodland. 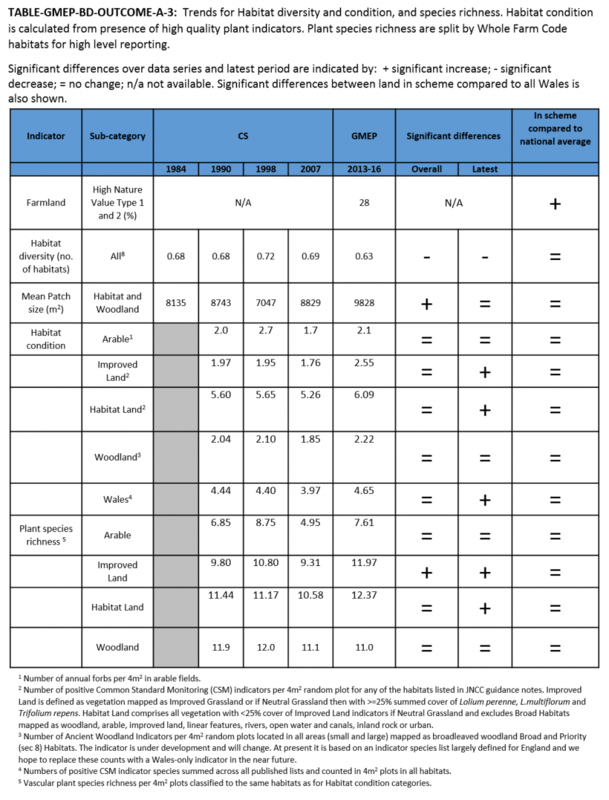 Patch size of habitat and woodland has increased over the last 30 years. The condition of Blanket Bogs are improving as is Purple Moor Grass and Rush Pasture - two Priority Habitats. These habitats have been targeted for improvement for many years and many actions have been undertaken to support their recovery. The relative importance of restoration practices, an improving pollution climate and/or rainfall changes need to be explored. Initial analysis suggests a recent increase in the area of blanket bog and montane habitats. A composite indicator of species data from the Butterfly Monitoring Scheme indicate that specialist butterfly groups have recently stabilised after declining for many years. 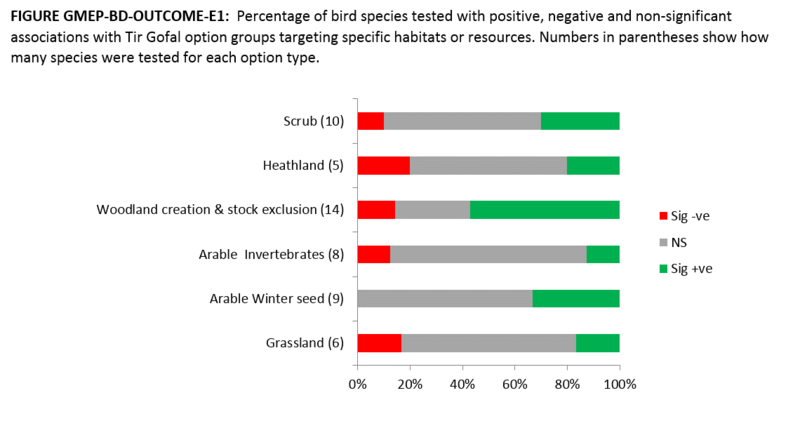 BTO/JNCC/RSPB Breeding Bird Survey data indicate an increase in woodland and upland breeding bird populations, and stable overall bird diversity over the last 15 years. The last two years of data also suggest lowland bird populations may have turned upwards after a 15 year decline. 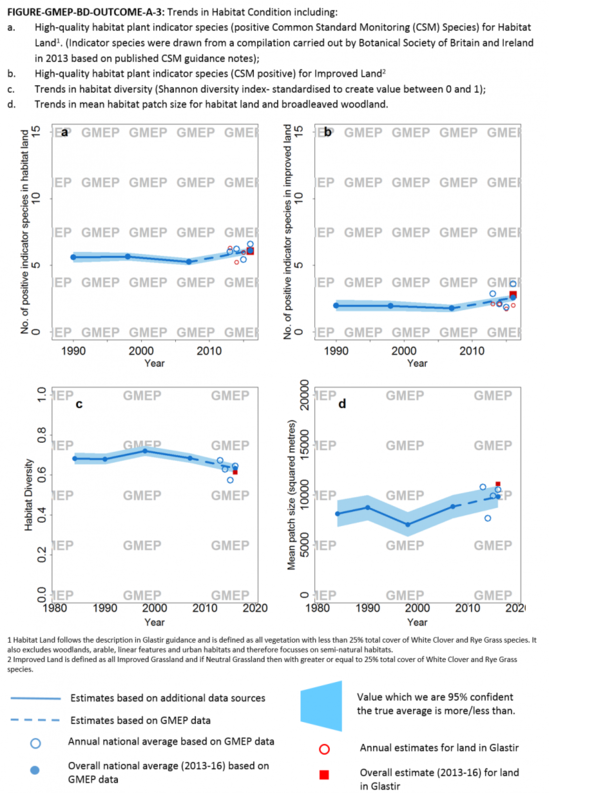 A new metric for priority bird species indicates 65% have stable or increasing populations with no consistent trend over the last 20 years. A recent decline in the area of dwarf shrub heath. 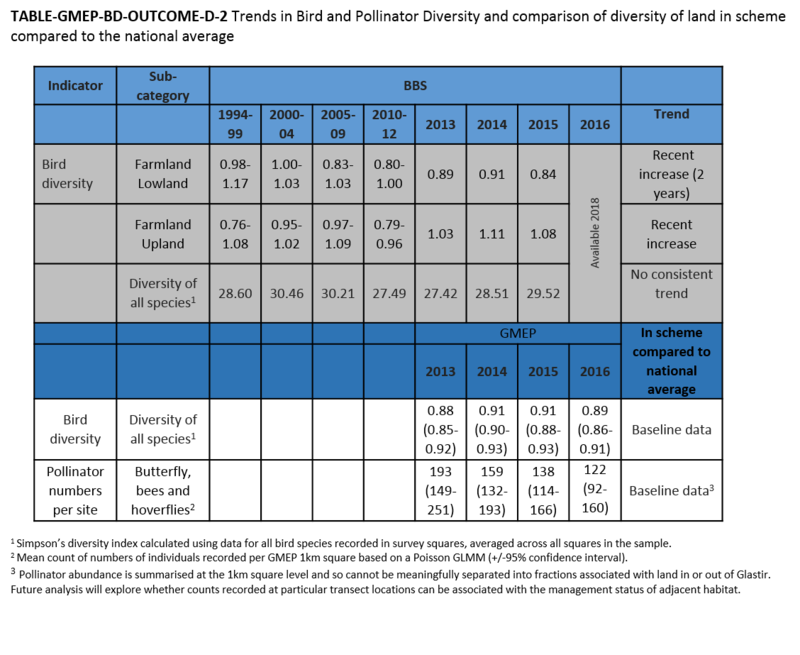 BTO/JNCC/RSPB Breeding Bird Survey data indicate an average decline (15 years) in lowland birds populations which may have turned upwards since 2012. 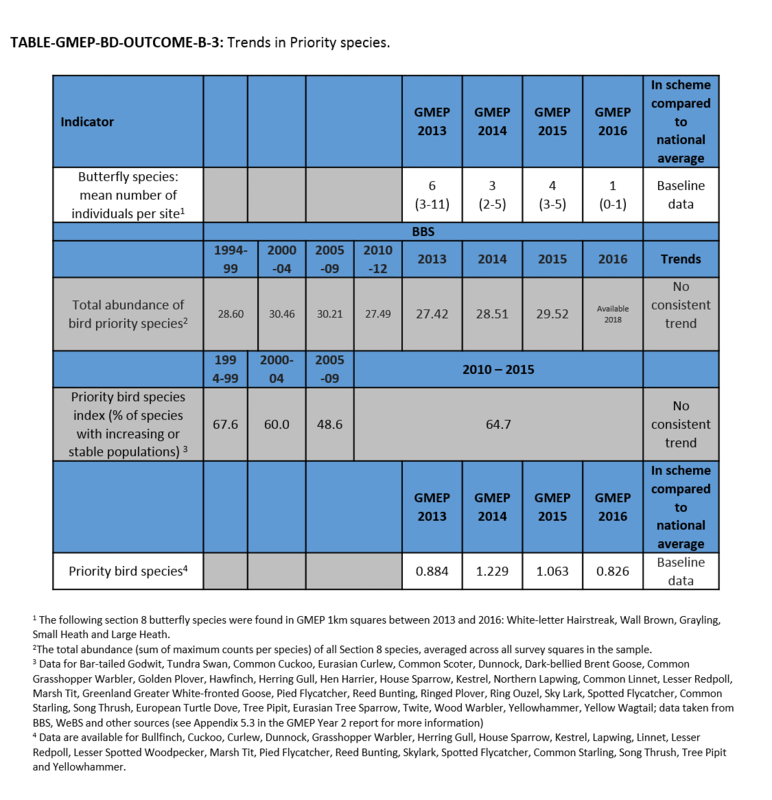 New analysis of BTO/JNCC/RSPB Breeding Bird Survey data for GMEP to create a priority bird index suggests 35% of priority bird species remain at risk with declining populations. 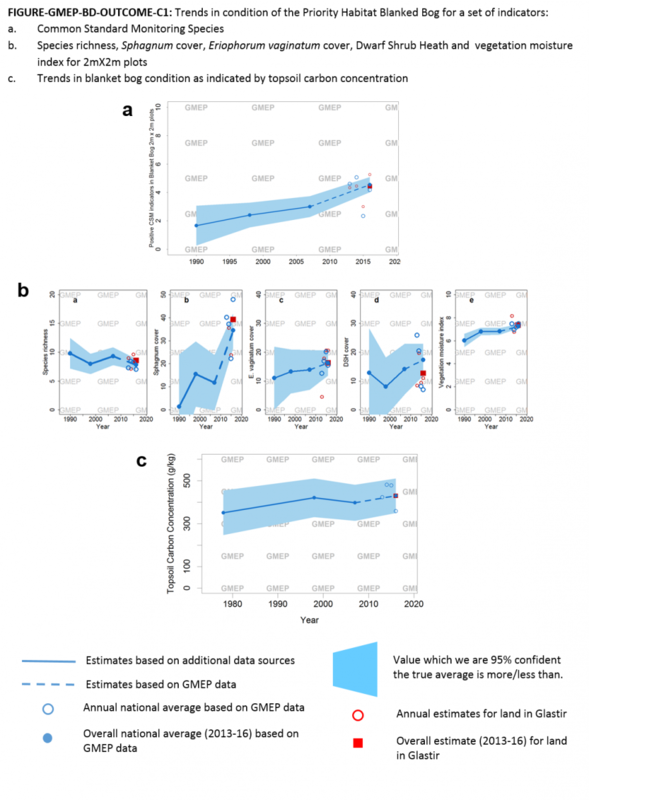 New analysis of trends in under-studied species by the Biological Records Centre identified 10 taxonomic groups with negative net change trends, with the remaining 8 taxonomic groups showing a positive net change trend for the period 1990-2000. The data was captured by opportunistic biological recording by 16 societies and recording schemes.